Here’s the video for French Minimal SynthPoppers Tristesse Contemporaine’s new single, the hypnotic and moving Waiting. A track loaded with 80s synth experimentalism and Indie-Electro cool. 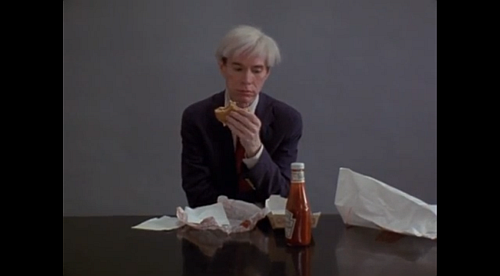 The video is directed by Jørgen Leth, and taken from his film 66 Scenes From America in a scene titled Andy Warhol, Burger. Tristesse Contemporaine’s Waiting is released 13th May on Record Makers. Parisian Indie-Electro trio Tristesse Contemporaine actually comprises a Brit, a Swede and a Japanese girl and are about to release their second single, ’Hell is Other People’, later this month. It’s an interesting, introspective ElectroPop track. Quite minimal, quite moody. reMixes are supplied by Chloe, Clement Meyer and this track from real French Parisian Yan Wagner. Mr. Wagner takes things into a slightly more upbeat, ElectroPoppy place with his reMix, but keeps things in an atmospheric, brooding place. The subdued vocal works really well with this new urban futuristic backing. Sparse dance beats and a bouncy bassline make a nice core for the more ethereal elements of the track, shimmering synth hooks and floaty pads. Interesting, Intelligent, ElectroPop. Tristesse Contemporaine’s ‘Hell Is Other People’ is out 25th June on Pschent Music. Here’s the new video for Tristesse Contemporaine’s ‘I Didn’t Know’. A minimal slice of urban ElectroPop that is perfectly complimented by some stark visuals. ‘I Didn’t Know’ comes from Tristesse Contemporaine’s forthcoming self-titled album, released in March.